The need to constantly upgrade EPOS equipment and the cost of fitting onto existing checkouts has often meant that checkouts are renewed well before they have reached their end of life date. Retail Associates are industry leaders in producing lower cost alterations to existing checkout types to ensure that changes to EPOS hardware do not result in expensive alteration costs. Our extensive knowledge of most UK & European manufactured checkouts has enabled us to produce design and alteration solutions undertaken on site to minimise both cost & downtime associated with equipment change. 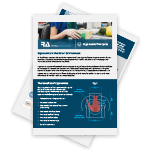 Irrespective of the degree of change (whether a simple addition of chip & pin or full EPOS change) a solution can be readily available and as an additional benefit alterations can often bring improved ergonomics to older checkouts.